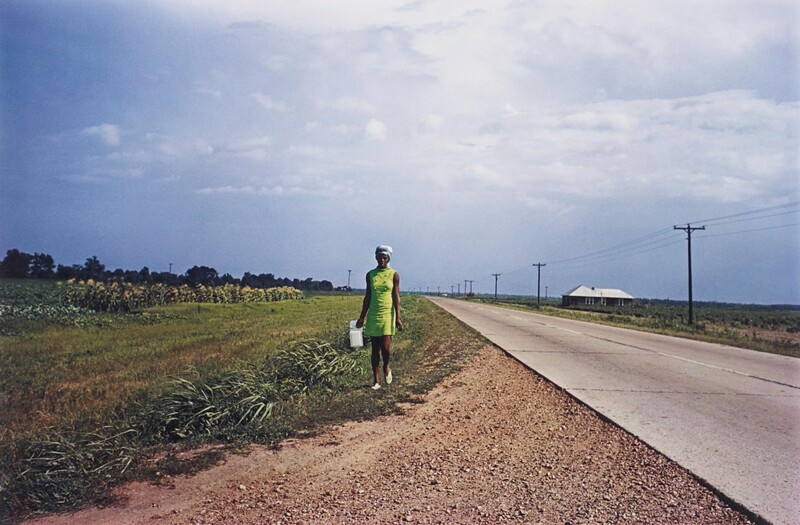 Just as Eggleston’s complex, labor-intensive process yielded a result that could be linked to amateur snapshots, so his identity could be seen to straddle Modernist pretension and Southern kitsch. By Anna Kerrer Kivlan, Massachusetts Institute of Technology, 2007 – The second part in a multi-part text on Eggleston. 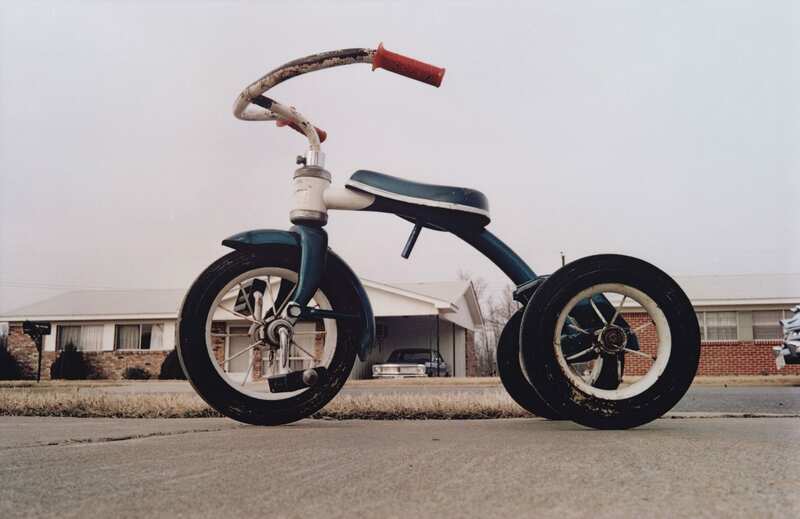 Just as Eggleston’s complex, labor-intensive process yielded a result that could be linked to amateur snapshots, so his identity could be seen to straddle Modernist pretension and Southern kitsch. The identity of photographers was then, and continues now to be, a charged issue in the United States. Some even suggested that the art form itself belonged to Jewish image-makers. 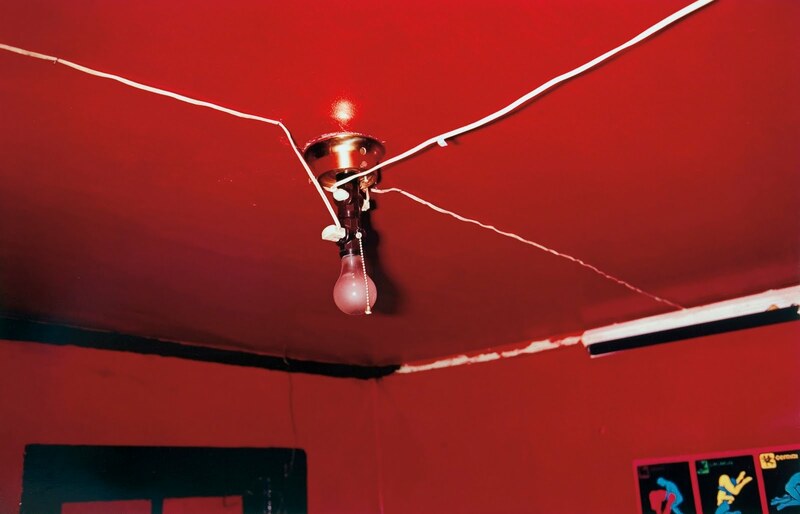 In 2002, the former Artforum editor and critic Max Kozloff published a compilation of images titled New York: Capital of Pbotography, and organized an exhibition at the Jewish Museum in New York. The book and exhibition, focusing on street photographers working in the city, noted the number of practitioners of Jewish backgrounds and argued for a distinct aesthetic along these lines. “The great majority of the photographers concerned were or are Jews,” he wrote. “In truth we are dealing largely with a picture archive of an American city visualized by Jews, to which a few distinguished Gentiles have contributed.”33 Kozloff is not alone in making such claims. During the 1970s, Garry Winogrand often quipped, partly tongue in cheek, that to be a great photographer, one first had to be Jewish because they were nervy, ironic, disruptive of artistic norms, and proud outsiders.34 He concluded that Eugene Atget must have been Jewish because his photographs of French life on the tattered fringes seemed so Jewish in spirit (Fig. 2). 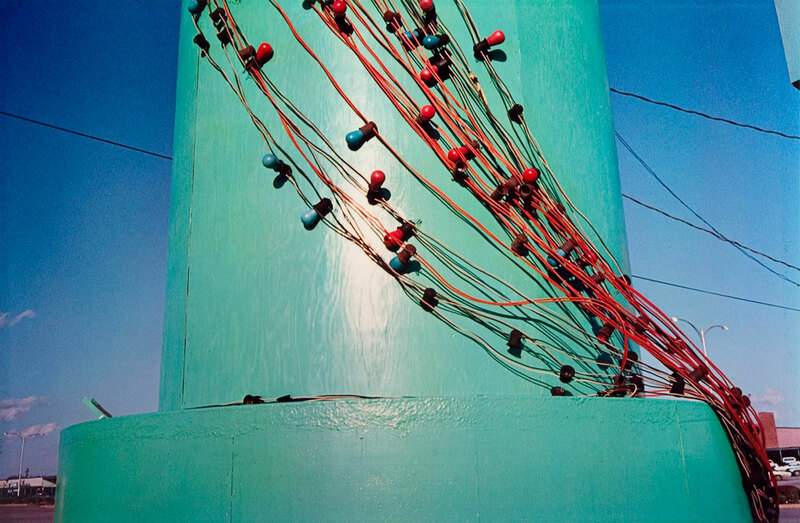 Eggleston has traveled and worked throughout the world-in Kenya, Germany, China, Japan, and Egypt-but his reputation still seems to rest on his well-known photographs depicting mundane Americana (Fig. 3). 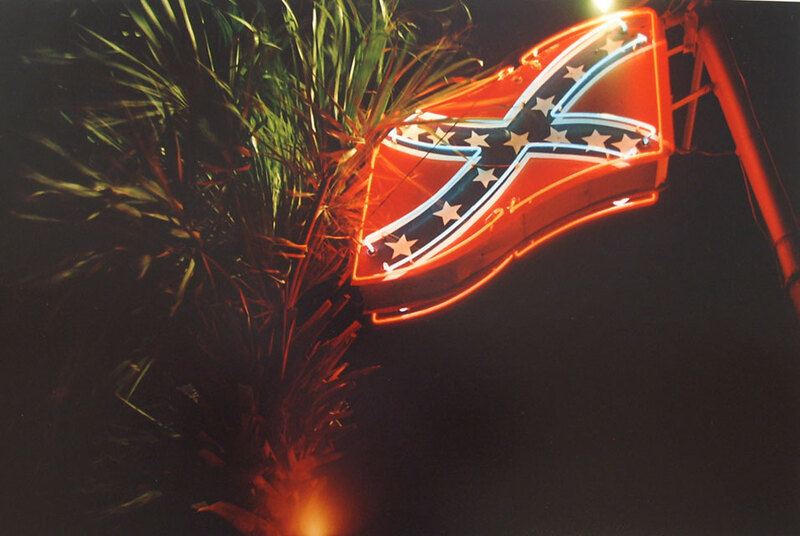 Eggleston’s Untitled, 1973 photograph literally shows a battered, Confederate flag license plate ensnared among sickly vegetation, caught in dead center by an eerie glow. Born July 27, 1939, in Memphis, Tennessee, and raised on his grandparents’ plantation in Mississippi, the photographer once stated dryly that the centripetal composition of all of his pictures was based on the Confederate Flag.38 Eggleston’s Untitled,1973 photograph literally shows a battered, Confederate flag license plate ensnared among sickly vegetation, caught in dead center by an eerie glow (Fig. 4). Re-appropriated as pure form, this death of the Confederate flag is divested of its brutal legacy, but its lingering symbolism gives a whiff of the rebel South. Accordingly, the forty-eight color photographs selected for the Guide index the insular and vernacular in Mississippi, Memphis, Louisiana, and Alabama. Many of the images in the Guide suggest temporal displacement, almost supernatural moments of limbo suspended in the aftermath of horror or the restless anticipation of an uncertain future. Cemeteries and post-funeral scenes funerals occupy several. One image shows an old truck parked in a driveway behind a fence full of blooming purple flowers, contrasted with dying brown grass covering the ground beneath them. Another depicts the lifeless trappings of a decaying Southern aristocracy: a portrait of a young child in a carved, gold-embossed frame hangs on the wall above a delicate china tea set atop a gleaming silver tray. On the left side of the frame, an open cabinet of Wedgwood china bowls and plates sits in darkness. (Fig. 5) To the right of this scene, an open door leads through a sitting room in orangey light to a space that might be a kitchen, bathed in the daylight streaming through a glass paneled door, revealing wisps of cloud in a pale blue sky. The daylight cuts through the mausoleum-like environment of the darker room, creating an orange line along its doorframe that violently circumscribes the precious and decadent objects in its shadowy comer. 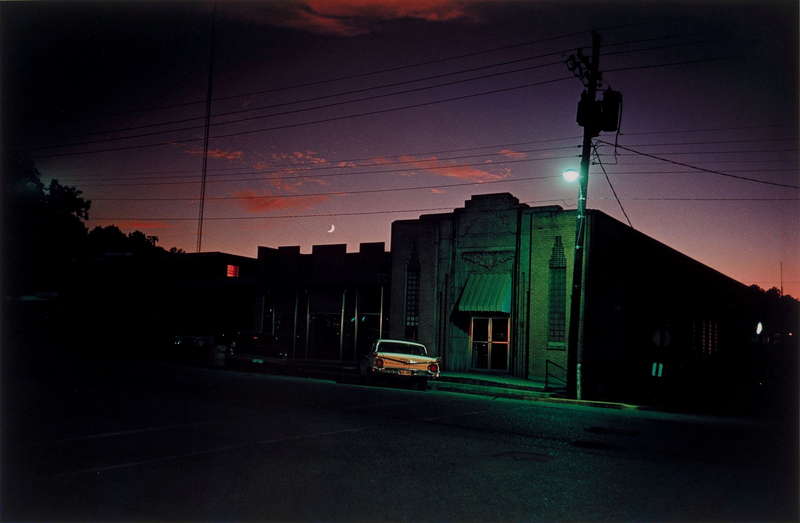 Such attention to temporal displacement and nostalgia often produces an unsettlingly romantic effect, one which surely helped him to land commissions photographing quintessential Southern locations: Plains, Georgia, on the eve of Jimmy Carter’s election in 1976; Graceland in 1983; and images for a 1990 book with text by Willie Morris Faulkner’s Mississippi. Eggleston himself has alluded to a kinship between himself and Faulkner, a fellow Oxford, Mississippi native, at least when it comes to drinking: “I’ll wake up some days and think, I’m gonna’ get drunk today. It’s not just I think I’ll have a cocktail before dinner. Faulkner took drink in much the same way.” Eggleston’s drawl and locution is itself an upper class Southernism, self-consciously placing him within the aristocratic social class he lays claim to (Fig. 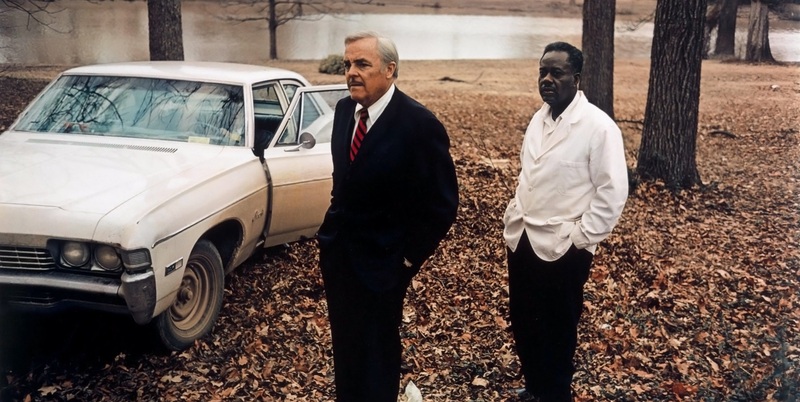 6).40 This purposeful identification with Faulkner underscores the fact that, despite his constant protests against the label of “Southern” artist, Eggleston seems to have willingly assumed a public persona built in part from Southern stereotypes. This stylized gentleman, put into the New South, abetted silence about the region’s more uncomfortable social aspects-the issue of Civil Rights, for example-coupled with the cultivated visual stereotypes that afforded aesthetic cachet: kitsch, road tripping, Elvis and Faulkner, dandyism, boozing, and even the Confederate flag. 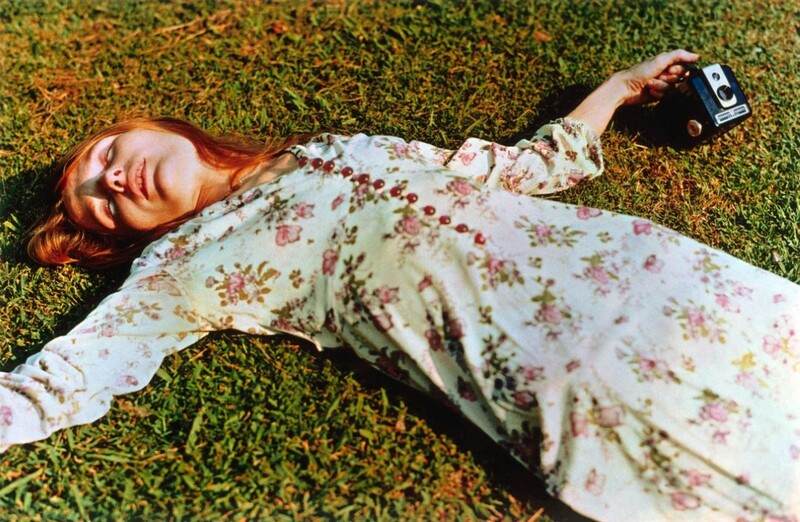 More broadly conceived, Eggleston taps into a potent reserve of tropic American visions from popular culture, seen in films like the 1969 Easy Rider; the 1963 photo book Twenty-six Gasoline Stations by Ed Ruscha (one of Eggleston’s favorite artists), and rock n’ roll bands like Lynard Skynyrd (Eggleston, for instance, liked to refer to his wild youth as his “rock n’ roll days”). There had been a profound shift in such tropes the time since Walker Evans was commissioned to photograph the Great Depression for the U.S. Farm Security Administration in the ’30s. Evans was one of the so-called ‘FSA photographers,’ who made a substantial contribution to establishing the South’s impoverished image during the 1930s, and chronicled the many changes happening in the region.41 Historian Leslie Baier is not alone in observing that Evans’s 1936 photographs of Alabama sharecroppers in James Agee’s Let Us Now Praise Famous Men confront the viewer with unrelenting intensity and cast a harsh light on rural poverty.42 Since the FSA constituency comprised poor, disenfranchised, and politically marginal farmers, it was vital to the future of their federal aid that the FSA cultivate a public and congressional mood of sympathy for their plight, according to British historian Stuart Stanley I distinctly American notion of “rugged individualism” that shunned public assistance programs on moral and aesthetic grounds, and the reassurance of the economy-minded that the cost of aid was justified, white clapboard houses, and roadside farm stands sprang from a political imperative that was separated by a deep chasm from artists of the sixties and seventies like Eggleston who reappropriated some of the same imagery.43 The full-color picture, Near Extinct Plantation, Mississippi, in William Eggleston’s Guide, (Fig. 7) for example, is separated from Evans’s similar, black-and-white, 1936 picture, Untitled, Cabin, Hale County, Alabama featured in the book, Let Us Now Praise Famous Men (Fig. 8). Intervening years had witnessed the perfection of color television, the post-World War II economic boom, Truman, Eisenhower, Kennedy, Johnson and administrations, and the Civil Rights Movement. Yet if the identity was Southern decadent, the photographic practice was ambitious and serious. 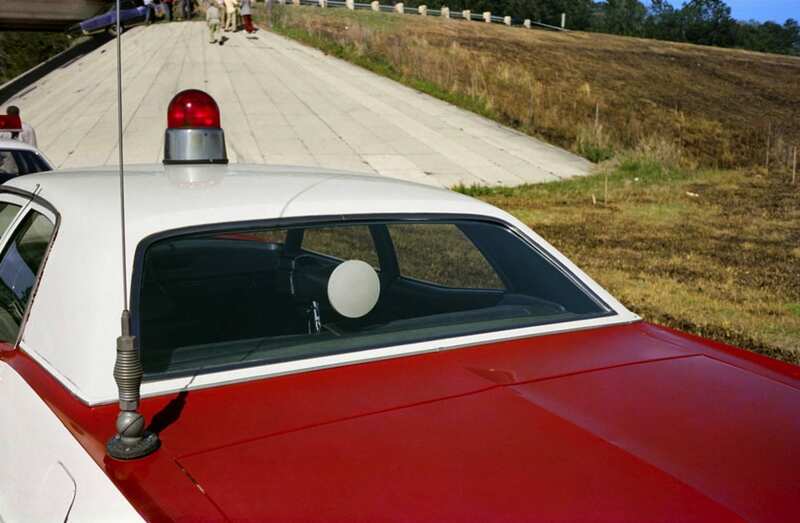 Eggleston started photographing at age ten with a free-focus snapshot camera. By the 1960s and 1970s, any deep-seated Depression-era interest in social reform stoked by the FSA project had been displaced by a preoccupation with enjoying the nation’s affluence.44 Enriched by savings from the war period and smitten by an array of new appliances and cars, many Americans had, during the 50s, been oblivious to the needs of the impoverished in both urban and rural areas.45 By 1960, rising wages and a partnership between government, the housing industry, and the automobile industry powered economic growth. Providing cheap housing loans to veterans and other homeowners and underwriting a large share of the costs of a massive expansion of the nation’s roads, the government promoted a housing boom in the suburbs and the production of large numbers of cars. 46 While the emotional purchase of “Depression Modern” assisted by the FSA program might have lingered on (now ripe for exploitation by a potent advertising industry) most 1970s consumers of visual culture, in a daze of commodities, had forgotten where it came from.47 It is precisely at this juncture we find Eggleston, slyly admitting to his hard-drinking, gun-collecting Southern ways. And while he may be a Southern gent, he’s no Southerner. He and Szarkowski tell us that the photographs in the Guide-cemeteries, old trucks, and rotting plantations-are not about the South but about form for its own sake. The symmetry of Untitled, Algiers, Louisiana, ca. 1970, for example, is rhythmic, the frame governed by a logic that is contingent upon nothing but the smooth contrast of warm and cool colors (Fig. 9). 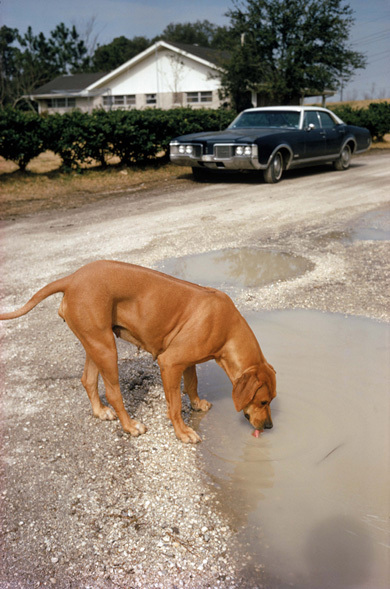 The copper fur-short and velvety-of a dog lapping contentedly from a milky puddle in the foreground vies for attention with a car set back in the distance. A white house behind a row of shrubs creates a geometric counterpoint to the rectangular windshield, hood, and headlights of the car. We are led to think the dog is a mongrel stray, left to its devices in this depopulated world of shapes, slurping a cocktail of engine fuel, urine, and acid rainwater from a sandy puddle in back of a modest suburban Louisiana home. While the picture, by some accident of geography, may reveal how the new wealth of the Sunbelt has been dogged by the region’s poverty-stricken past, the photographer’s insistent attention to form creates a Northern “frame” that reassures the (Northern) viewer of control over the familiar content of Southern poverty evident in the picture. Eggleston’s Southerness and his exploitation of classic American tropes was parsed out by Hugo Williams in a smug, mocking profile for the Times Literary: “The washed-up, disjointed, incongruous imagery that we all know and love from a thousand road movies and record covers has been his tutor and his raison d’etre.”48 While Williams calls Eggleston a “Southern gentleman,” he does not conflate that persona with the photographs themselves, musing that what they tell us about the South “is anyone’s guess.” Almost a decade later, Charles Darwent, another British journalist, characterized Eggleston as “Rhett Butler with a camera,” perhaps having learned of the man’s alleged fondness for driving around Memphis listening to the Gone with the Wind soundtrack. Appearing in London’s The Independent on Sunday, the title of the article, “King Crimson,” referred at once to Eggleston’s formalism (the use of startling blood-red in the legendary Red Ceiling photograph is exemplary), his rumored rock n’ roll lifestyle of pills, pricey cars, booze, and women (King Crimson is a British rock n’ roll band of the 1960s and ’70s), and his sage-like position as the father of color photography (Darwent likened his conversation with Eggleston to consulting an oracle) (Fig. 10). 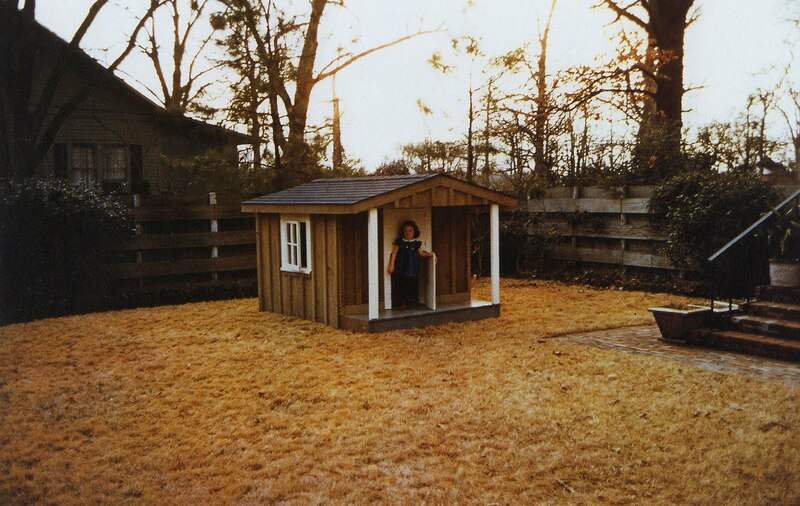 Eggleston patently rejects the label of “Southern artist,” and his wife Rosa agrees: “It just sticks in my craw when people drag that into the discussion”. Posted in Artist Short List, Highlights and tagged 1950-1970, Anna Kerrer Kivlan, Archive Highlights, Charles Darwent, Color Photography, Confederate Flag, Diane Arbus, Easy Rider, Essay, Garry Winogrand, Hugo Williams, Max Kozloff, NYC, Photography Highlights, Popular William Eggleston, South, Top Picks, Walker Evans, Walter Hopps, Weegee, William Eggleston.